Little boys have been characterized as hungry little noises with dirt on them! The last two parts of that description are on display when playing with their favorite sandbox or dirt pile toys. The don't mess with my dozer personalized Christmas ornament looks like the toys and the real things too. These kids ornaments personalized for special youngsters arrive in our custom velvet gift bag with a display cord already in place. We use a hand-lettered, handsome font to add a name and the year to this personalized excavator ornament. 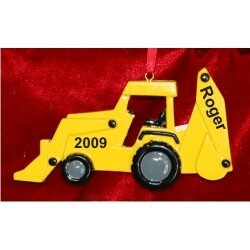 Guys who drive these rigs for work also love the yellow backhoe personalized Christmas ornament from Russell Rhodes.